I love buying gifts for other people as much as I love wrapping those gifts and taking the time to craft up some homemade cards. Like, LOVE. But the little, itty bitty grinch inside of me really, really doesn't like the stress of the searching process to find the perfect gift, especially when the deadline gets closer, and closer, and closer, and you start to lose your mind as well as hope. This year, the majority of the gifts I'm buying are for members of Jeremy's family and, since Jeremy is more of a gift card kind of guy, I'm leading the charge on present selection. What does this mean? THE PRESSURE IS ON. The list of family members we have to shop for range from a newborn (coming soon), to a teenage girl (I don't know what they even like these days - does it mean I'm now uncool), to parents who usually seem to have everything they already need. We're really covering all aspects of the family spectrum here. Some of them I crossed off the list instantly, but others are almost impossible to shop for unless you settle for the same "tried-and-true"gift that they always get, year after year. And I refuse to succumb to the "tried-and-true" method. Absolutely not. So I will continue to suffer through those holiday aches and pains (mostly mental, but also physical and financial) and just wait for that oh-so-satisfying moment where they open up their gifts. Power on, fellow gift givers. I agree completely about the stress of searching as the time to decide on what gifts to buy gets shorter. 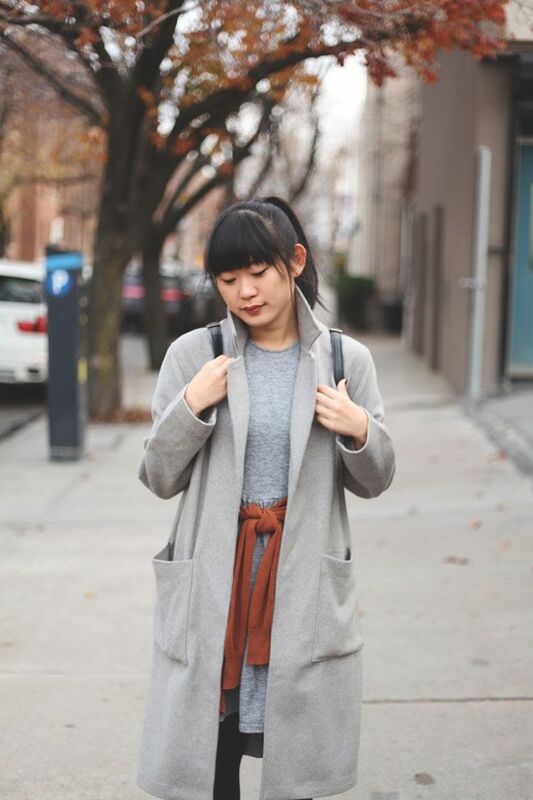 Your Forever 21 Gray Longline Coat and gray PopBasic dress look lovely styled together. 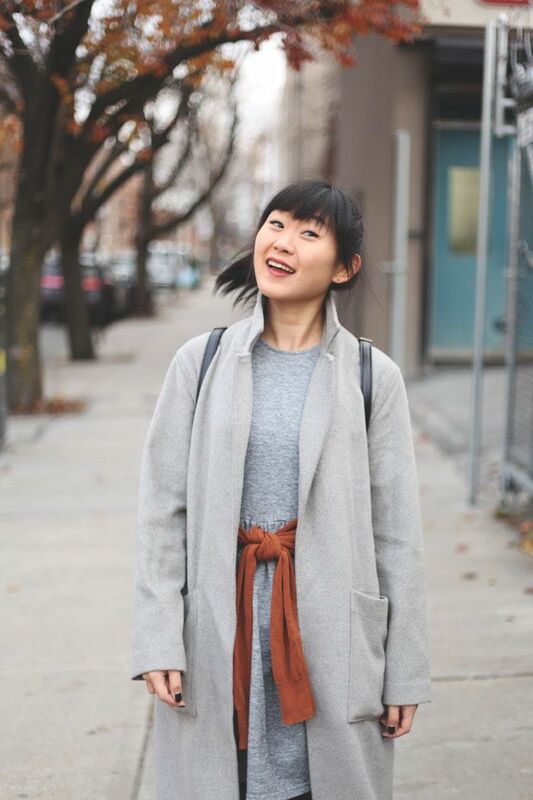 The Madewell rust cardigan adds a nice pop of colour to the outfit and your lipstick looks very pretty. love this look! I have a gray dress just like that that I know exactly what to do with now!! Love the pumpkin orange pop on a field of grey. I love the fall-ness of these photos! I hear you on the stress of buying gifts. Most years, I just do a couple days of frantic holiday baking instead and put together tins of Christmas goodies everyone. It removes the stress of decision making, and fortunately, everyone usually seems pretty happy to get treats to munch on. Lovely outfit as always! That coat is just stunning! You always have such spot-on outfits! Stunning outfit, LOVE your coat! I completely understand what you're talking about! I haven't got anything for anyone (except about 2people) yet, and it stresses me out a lot! I'm running out of time, but I hope I'll figure something out :) Hope you have a wonderful weekend!! Gorgeous outfit! 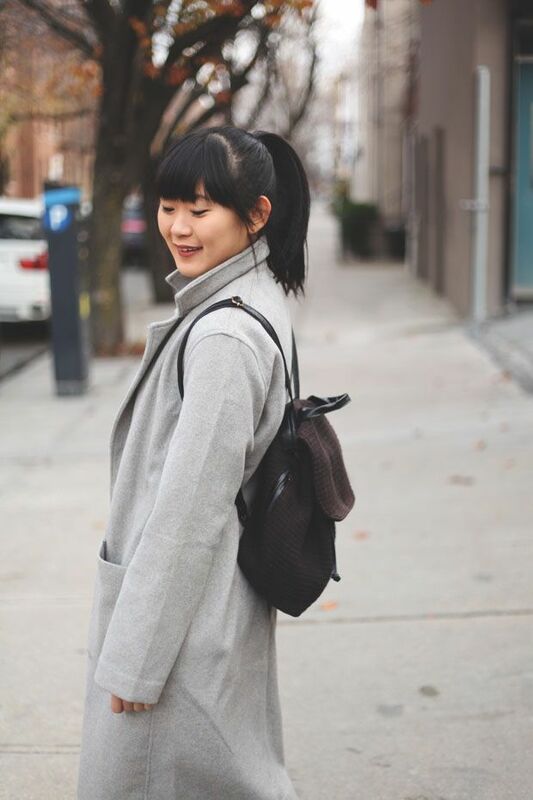 I followed you on bloglovin, I would appreciate it if we could connect and follow me as well. Ah your bangs are really tempting me to cut my own bangs! 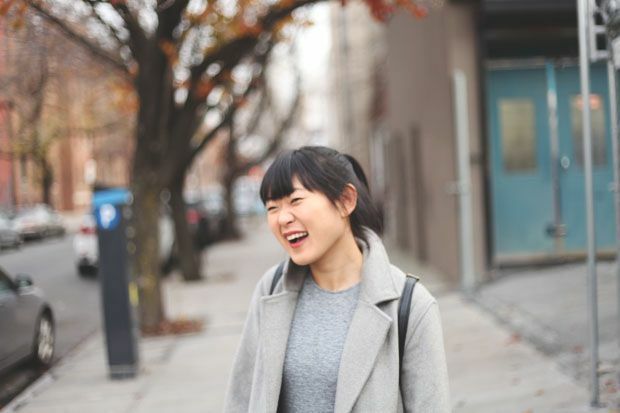 Straight bangs are absolutely adorable haha and your outfit looks wonderfully warm! & I know what you mean about finding the perfect gift. I absolutely love giving gifts, but this year, I wracked my brain for hours for the perfect gift that would make the other person faint from joy! Tried-and-true gifts are cop-outs lol I refuse to cop-out. Sending good vibes so hopefully you find the perfect gifts to give to those who have it all! Good luck! 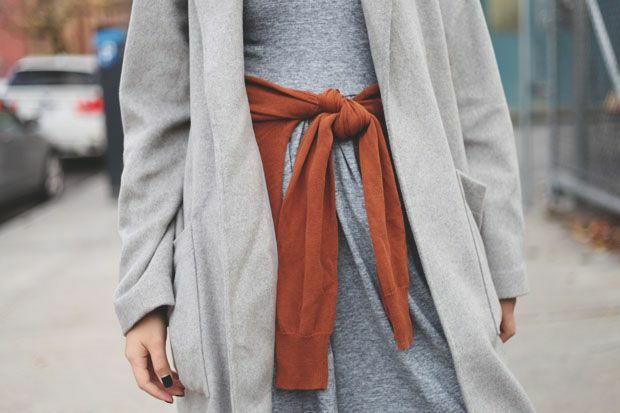 The grey on grey is too perfect with the pop of rust. That colored sweater around your neck really makes the outfit IMO! It's such a gorgeous gorgeous shade for fall/winter. Also, totally feeling you on the holiday stress. Hopefully everyone on the list will be crossed off by the end of this weekend! 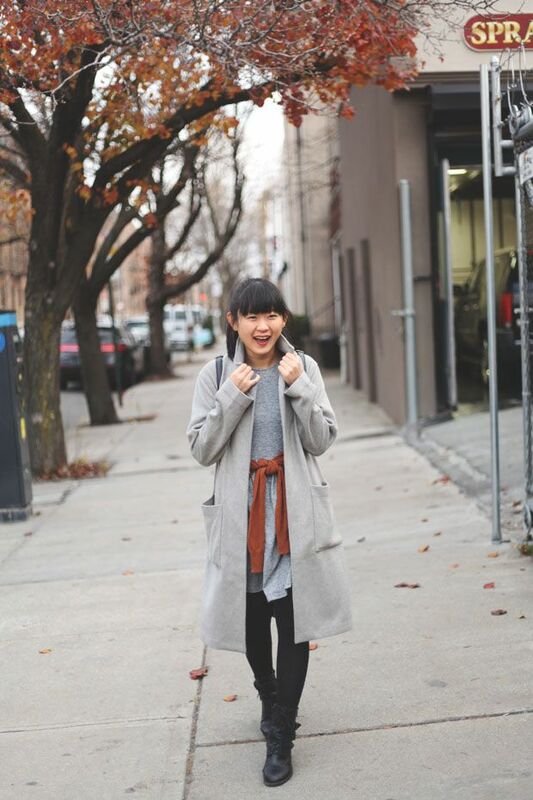 nice outfit girl,totally love your outer ! You look so cute! And such a cozy outfit! Hang in there Jen! I feel your pain. My husband typically makes me take charge on the gift buying and gives little input...which is super stressful! I'm sure whatever you give will be amazing and they will appreciate the thought no matter what it is. Someone else's family members are so hard to shop for! Especially if you don't want to do the very general, impersonal options. I stress out about gifts SO much, but I still love doing it. You got this, girl! It's all your state of mind. I believe in you. And yeah, it seems difficult to shop for someone else's family members opposed to your own... I mean, sometimes figuring out gifts for your own family can be quite the task. This is just the cutest post! You look so lovely and happy!